WINNIPEG - It’s party time at Winnipeg’s Assiniboia Downs. Saturday afternoon, it’s the 144th running of the Kentucky Derby and you can wager on the race at our local race track. But be prepared. It’s a competitive field and it’s going to be a great race. 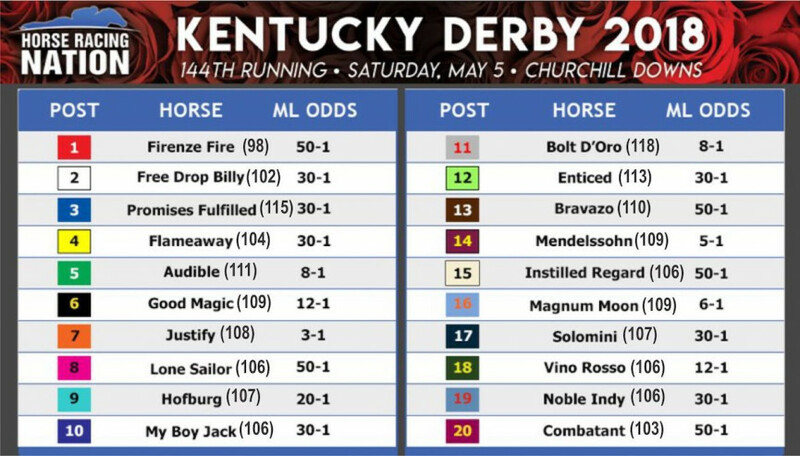 “A Churchill Downs commentator said during the post-position draw Tuesday morning that this Derby has all the makings of a Derby that will still be talked about even 20 years from now,” said Ivan Bigg, one of the Downs’ top handicappers. “Which means that shwag – the Derby glass and merchandise -- will be in demand long after this Derby is in the history books. So be sure to get your free Derby glass at the track or at an OTB (while quantities last) and enter the draw for Derby merchandise including four Triple Crown glasses and Kentucky Derby cap, T-shirt and tote bag. Ivan’s usual Saturday morning, I Won Big Workshop at 10:30 a.m. on the Clubhouse plaza, will concentrate strictly on the Derby (for superfecta play) and the four races before that in order to play the Pick-5 and Pick-4. Everyone is invited and all participants will receive a generous $5 top-up to their $20 shares in the day’s group tickets. There are 20 entrants in the 2018 Kentucky Derby and the favorite, Justify, will come out of the No. 7 hole. The winner of the Dubai Gold Cup, Mendelssohn is the No. 2 favorite at 5-1. He’ll head out of the No. 14 post position. The third favorite, Magnum Moon, in the No. 16 position, is 6-1. And one of my favorite horses, Bolt D’Oro, comes out of the 11 hole and is next at 8-1. Of course, the Derby is Saturday’s celebration. There is more going on at the Downs this weekend. On Friday, Saturday and Sunday the free VLT tournament starts at 8 p.m. And make sure you get into the draw for 10 chances to win $20 in free VLT spins. The top winner from each night participates in a month-end finale for more spins and $250 in prize money. And, of course, every Friday and Saturday the Downs presents $10 buy-in poker. The registration is at 8 p.m. and the game starts at 8:30 p.m. The Royal Flush progressive jackpot for the Friday is $5,730. However, don’t forget, that effective on Friday, May 18, the poker competition will change to registration at 7:30 p.m. and game at 8:00 p.m. Poker will be played in the Trackview Gallery on the third level during live racing. The 144th running of the Kentucky Derby is scheduled for 5:34 p.m. CST, but the actual race will not start until 12 minutes after the advertised start time, at 5:46. The race card at Churchill Downs on Saturday begins at 10:30 a.m. CST and you can bet all the races at Assiniboia Downs.